In the Clients page you can view information about the clients in a network. Follow these steps to access the Clients page. Select a network and click Clients. Here are settings on the Clients page. Name The default name of a client is its MAC address. QUICK TIP: To rename a client, first select a client and then click Rename. Enter a friendly name in the field and then click Confirm. Last Seen This is the timestamp of the last time the client was seen on the network. Wireless SSID This is the Wireless SSID that the client is connected to. Access Point This is the name of the access point the client is connected to. Signal This shows you the signal strength of the access point. Bandwidth This shows you the bandwidth usage of the access point. Policy Displays the policy of a client that is set on the access point. Click the ellipsis icon to change the policy for a client. Blocked - select an SSID to block a client from. 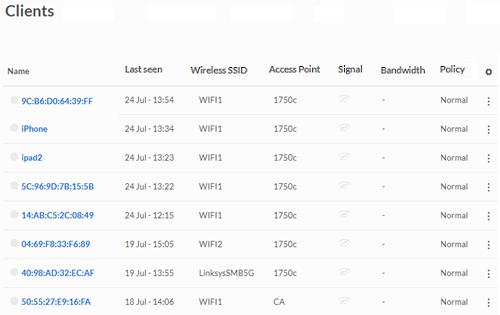 You can block up to 20 clients per SSID. 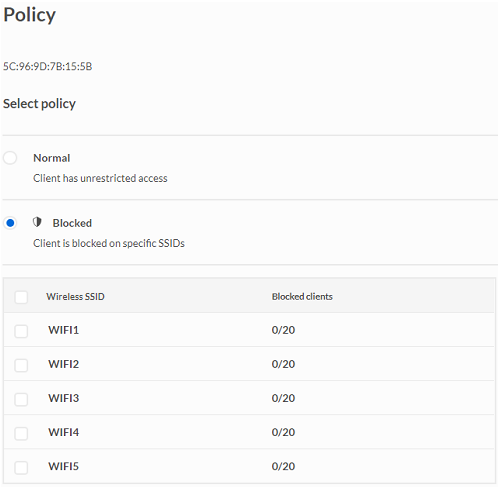 QUICK TIP: To set a policy, just choose whether to give normal access or to block a client from specific SSIDs. Once you are satisfied with your settings, click Save. Other Client settings Ellipsis icon - you can click the ellipsis icon to enter and select Connection, Details or Policy. 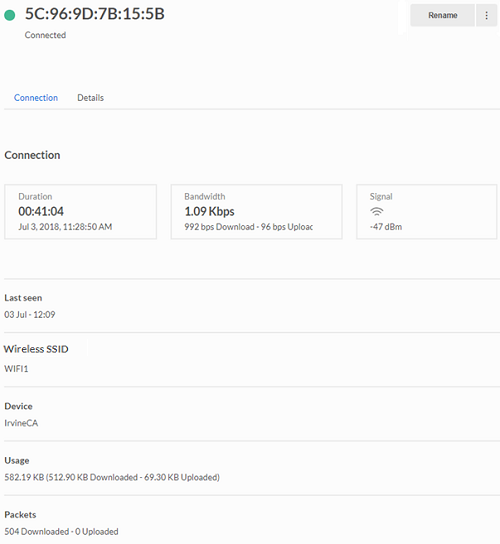 Connection - displays the client connection information. You can click Rename on this page to rename the client device. Name - the client’s name. NOTE: The client's MAC address is the default client name. You can also click Rename to change it.